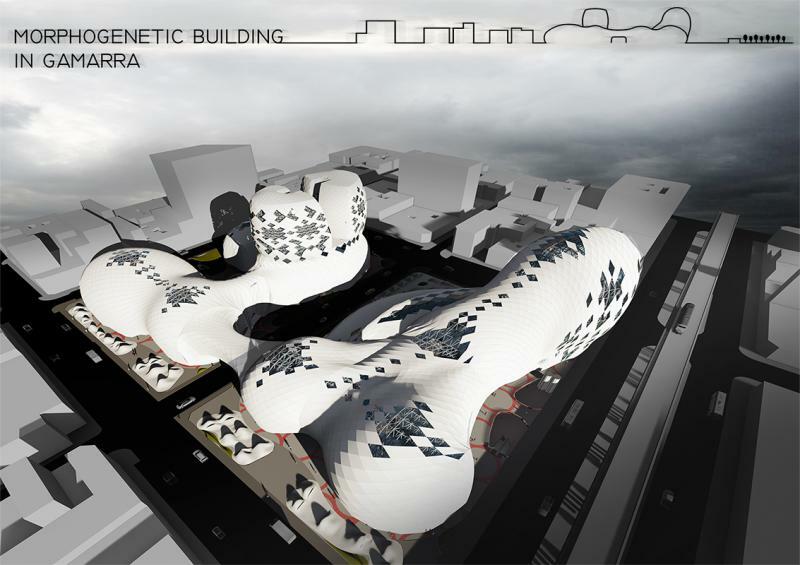 The concept of this project was design a morphogenetic building using parametrical design for making contrast with the context. The project was a hybrid building because in Lima,	Perú we are running out of empty land so we have to exploit the best we can the land we have. Because of this I design a hybrid building where people could work, eat, sleep, relax,	go shopping; all in one place. Which is also the place with the most expensive square meter in Lima because it is a very strong commercial area. The form is going to introduce	Gamarra in the 21th century because now with all the new shopping malls is being relegated. Also, I tried to solve one of the most common problems in Lima and that was the	informal sellers, for that I design a special type of commercial habitat: the commercial dunes, there are like kiosks but much better. The building occupies two blocks and has in it	in the first 3 levels a commercial area, in the 4 level it has workshops like a little industrial space, in one block the building has apartments and in the other block it has offices. The project is very well located since you can get there from either side with the metro line or by buses. Additionally, the project has a lot of public space for people to recreate. The project is a building of multiple uses, contains 4 different uses: housing, commerce, offices, and industry. The project inside and out uses a palette of neutral colors to contrast the exterior with the buildings which already exist in Gamarra. It has a space structure to support the form of the project, and inside the project a system of metal beams is used, it has a cover of plaster panels and glass panels in some areas. The project is thoughted in such a way as a person can live, buy and work in the same place without having to spend a lot in transportation as well as walking distances between one and another use.